Below is the rush transcript for "This Week" on March 9, 2014 and it may contain errors. RADDATZ: Good morning. Welcome to "This Week." Malaysia air mystery. Why did flight 370 vanish? This morning, breaking details on the massive search operation, the investigation into what went wrong, and those new questions about why two people boarded the flight using stolen passports. Collision course: Putin's standoff with President Obama over Ukraine. What happens next in their war of words? And stars align, conservatives crash the capital. SEN. TED CRUZ, (R) TEXAS: Our country is at a crisis point. RADDATZ: We take it all on, including our exclusive with Tea Party hero Ted Cruz. Plus, the powerhouse roundtable right here this Sunday morning. ANNOUNCER: From ABC News, This Week with George Stephanopoulos right now. RADDATZ: Hello, again. Good to have you with us. As we come on the air this morning, the mystery of what caused Malaysia Air 370 to vanish is deepening. The frantic search for the plane continues, but no signs yet of a crash. We have late word that the pilots may have made a last-minute maneuver to turn the plane back. And there is increased scrutiny this morning of as many as four passengers on that plane, including two who boarded using stolen passports. We have team coverage from around the world including the chairman of the House intelligence committee who's been briefed on the mystery and will join us in just a moment. But lets get right to David Curley for the very latest -- David. DAVID CURLEY, ABC NEWS CORRESPONDENT: Martha, this is the end of the second day of daylight searching, and still no sign of this Malaysian airlines 777. What we really need is these crews to find wreckage, then vessels can listen for the pings of those all-important black boxes. It's those recorders that could solve the mystery of the sudden disappearance of this jetliner. CURLEY: It's every flier's greatest fear, a plane falling out of the sky without a trace. And this morning the search continues over the waters off Vietnam for any signs of Malaysian Air Flight 370. The Boeing 777 with 239 passengers and crew on board took off after midnight on Saturday heading for Beijing. It's the red eye. But it was last heard from at the 50 minute mark, then nothing, no distress call, no mayday signal. This morning, Malaysian officials say there is a possibility that the plane may have tried to turn back to Kuala Lumpur. JOHN NANCE, ABC NEWS AVIATION ANALYST: We have probably over 60,000 flights every day all over the world, and that may be a conservative figure, and this sort of thing never happens. CURLEY: ABC's Bob Woodruff is in Beijing where families have been waiting for answers. BOB WOODRUFF, ABC NEWS CORRESPONDENT: David, I did have the chance to meet a lot of the family members here in this hotel where they are living these day. They told me that they're praying for a miracle, that maybe their loved ones are still alive. Perhaps the plane did not crash, maybe hijacked and taken away by someone to a safe place. That, of course, really does seem to be desperation. CURLEY: As the search now movies near the end of its second day, questions remain -- what exactly happened during what should have been the safest part of the flight? Among the possibilities, a structural or mechanical failure. NANCE: The likelihood of a structural failure in the absence of a thunderstorm or a mechanical failure bringing a big jet like this with such a superlative record down is almost infinitesimally small. CURLEY: Or possible pilot error. Today's modern aircraft are so advanced, some pilots have lost their basic flying skills, a dangerous situation that which the FAA calls automation addiction and that was a factor in the crash of Air France 447 into the Atlantic Ocean in 2009. Or the most troubling scenario, a deliberate act -- a bomb, a hijacking or possibly even pilot suicide. That took down Egypt Air Flight 990 off Nantucket in 1999. Federal officials are already working, law enforcement officials, with the Malaysians. But aviation officials from our country also to want to help. CURLEY: So right now Boeing and the NTSB have put together a team. It's poised and ready to go, but Martha, they need an invitation from the Malaysians and so far they have not received one. RADDATZ: Thanks very much, David. The chair of the House intelligence committee Mike Rogers joins us now with more on this mid-air mystery. Chairman Rogers, there's no direct indication of terrorism. I know you have been briefed on this, what can you tell us? ROGERS: Yeah, the investigation is in the early stages. So, there's two parts of it. One, the search for the wreckage, which is incredibly important to make some determination about what happened. And secondly trying to identify the two individuals who were traveling on stolen passports. RADDATZ: And what can you tell us about those individuals and how that could happen? Those people who's passports were stolen actually reported that. So, why weren't they stopped at some of those checkpoints in an airport? ROGERS: Yeah. Unfortunately this is -- it's not common, but it is not unheard of, either, that stolen passports can be re-purposed and used, mainly for the quality of the passports themselves. So, given the right circumstances, and in this case clearly it worked, they were able to board and gained entry. And they would be doctored up, there would be individuals who would have the skillset to change those passports just enough that they could identify with the individual that was using it. So, what they'll do now is they'll go back through the airport and make a determination through cameras and other means to try to identify the individuals and then track that back. So it's really very, very early. They're going through those processes now. And it will be just -- it will be a matter of time. They'll probably identify them. RADDATZ: Speaking of surveillance, I know the U.S., the Pentagon, has a tracking system and can see explosions in the air or missile launches. Any indication of an explosion that they may have been tracking and seeing? ROGERS: No. There's nothing that we've -- nothing that certainly I have seen that would indicate anything of the sort, which is certainly adding to the mystery. And again the important part is they are going to have to find some part of the wreckage somewhere in order to start making those determinations if it was mechanical or something else. RADDATZ: OK, thanks very much, Chairman Rogers. We'll be back with you shortly to talk about that standoff in Ukraine. But for more on the mystery of Malaysia Flight 370, let's bring in ABC's senior justice correspondent Pierre Thomas plus Colonel Steve Ganyard who is an ABC contributor, a former marine fighter pilot and also an accident investigator during your time in the military. Pierre, I want to start with you. You heard what Chairman Rogers said about those passports. But what is happening now in terms of the investigation as far as the U.S. is involved particularly? PIERRE THOMAS, ABC NEWS CORRESPONDENT: They're deeply concerned about those passports. They're trying to get as much as information as the chairman said. The surveillance video from the airport is going to be key. They'll use facial recognition technology to look at those faces and see if they can find any hits in the terrorism or criminal database. The other thing is the flight manifest is key. They're looking at the pilot, they're looking at the crew members, they're looking at all the passengers looking for any hint of something that would be untoward that would suggest terrorism or something else. Right now they say they have no direct evidence of terrorism, but they say they cannot afford to wait, they have to look at everything possible to try to get a fix on this. RADDATZ: Steve, you as a mishap investigator looked at all of this. The idea that the pilot turned around in flight, do you buy that? STEVE GANYARD, ABC NEWS CONTRIBUTOR: I'm still a bit skeptical. If you look at the radar tape, there's a bit of a heading change, but that heading change could be explained as he was turning on course, that he was just going on the normal course. We also know that they're way out at the edge of radar coverage. So I've investigated mishaps in the past where we've had airplanes just disappear without a trace, and we've found that sometimes that radar data, especially at range, is unreliable. RADDATZ: No mayday signal. What does that tell you? What might -- if it was a catastrophic failure, mechanical, all those things that David brought up, but no mayday signal. Why not? What do you suspect here? GANYARD: It's hard to suspect anything with a certainty. But we do know that if something catastrophic happened and the airplane blew up, obviously there would be no mayday. But if there was a problem in the cockpit -- let's set the scene. It's at night. Middle of the night, literally middle of the night, out over the board ocean, black, no horizon, the auto pilot is on, things are probably calm. Perhaps something happened in the cockpit. Maybe there was a major malfunction. The first thing the crew is going to do is fly the airplane. In aviation we have a saying, "aviate, navigate, communicate." So the last thing that would be thinking about would be talking about what was going about what was going on in the cockpit. If they have a problem, they're going to take care of it and they'll talk about it later. So, maybe there was a period in there where something catastrophic was happening and they just did not have time to communicate that. RADDATZ: I think it's extraordinary that we don't know where that airplane is. We have GPS in our cars, we have all these things, and yet they cannot find that airplane. In fact the last radar contact they have, it could be way beyond that, it could be anywhere. GANYARD: It could be in a lot of places. There's literally tens of thousands of miles of ocean that are going to have to be searched. Because we have this black hole where there's no radar data, we don't know the heading, the true altitude, the air speed, where that aircraft could go. So, it's going to take a lot of time to find that wreckage. RADDATZ: And that black hole is why? GANYARD: The black hole is there because the radar coverage only extends off the Malaysian coast so far and only extends off the Vietnam coast so far. So there's this gap in here. The world is a huge place. And it's not big enough to be covered by radar. Now if you're going to fly from Europe, you're going to be scene. If you're going to fly over the North Pacific, there will be data link and satellites, but a lot of the world is not covered by radar and sometimes planes are out there alone and unafraid -- they know where they are because they have GPS. But nobody else knows until they communicate. RADDATZ: In the past, you've told ABC -- you've kind of been dead-on on your predictions on what might have brought an airplane down. This one is so mysterious. Does your gut tell you anything on this one? GANYARD: It doesn't tell me anything, which I think means that we're going to have to keep the aperture open in terms of what we consider. Normally on this, I would not say that we would look at terrorism, but an airplane just does not come down or disappear at 35,000 feet. Everything is going to have to be considered. And I think terrorism we'll have to be one of those elements. RADDATZ: And, Pierre, this could take a long, long time, even if they find the airplane. THOMAS: Yes. They are saying they have to follow the evidence. And the key, again, is find that wreckage. They're very frustrated that they don't have any clue yet in terms of physical evidence. And the one thing I would add is that this comes against the backdrop of all those concerns about toothpaste container bombs, shoe bombs. The law enforcement and intelligence community was already keyed up and now they're more so. RADDATZ: OK, thanks very much, Pierre and Steve. Now to that escalating war of words between President Obama and Vladimir Putin over Ukraine. This morning, Russia tightening its grip on the strategic region of Crimea, despite warnings from the White House. ABC's Alex Marquardt is in the middle of it all in Crimea, where in just days, a critical vote will determine if the country splits apart -- good morning, Alex. These forces are part of what is believed to be a growing Russian presence. Here in Crimea this morning, their control tightening by the minute. Of course, Russia is denying these troops are even theirs. MARQUARDT (voice-over): On the move, large unmarked convoys of troops believed to be Russian, this weekend crisscrossing the Crimean Peninsula. The Ukraine/Crimea border reportedly now littered with land mines planted by pro-Russian forces, who, for the past three days, have blocked international military monitors from entering Crimea, even firing warning shots. In just 10 days, Russia has seized Crimea -- border crossings, airports, government buildings and military bases, just a handful still in Ukrainian control, but surrounded. And diplomatic efforts are still going nowhere. Presidents Obama and Putin talking past each other on an hour-long phone call. The U.S. criticizing next weekend's scheduled vote here to decide if Crimea should break off and join Russia. JOHN KERRY, SECRETARY OF STATE: Crimea is Ukraine. We support the territorial integrity of Ukraine. MARQUARDT: As Crimea prepares for next Sunday's referendum, this mostly Russian region is showing where its allegiances lie. (on camera): So what kind of passport would you like? UNIDENTIFIED FEMALE: Russian. I hate Ukrainian. MARQUARDT (voice-over): As this mostly Russian region prepares for next Sunday's referendum, there are a growing number of rallies for and against joining Russia. But that feeling is far from universal. We visited a small village of the historically persecuted Tartar community, now terrified of a Russian takeover. Even many Russian Crimeans, like this couple, want to see Ukraine work out its own problems. UNIDENTIFIED FEMALE: There are some international laws, you know. And we should follow them, but not with these, you know, Russian troops present here, because we can do it ourselves. UNIDENTIFIED MALE: It's time for politicians, not just from Ukraine and Russia, from all the world, to solve this one, because if you let Putin know to take Crimea, then maybe some other parts of Ukraine. Who knows who is next? MARQUARDT: But for now, a diplomatic solution is just a faint hope. Russia is refusing to speak with the Ukrainian government, calling them puppets of extremists. Instead, Russia is letting these troops do all the talking for them -- Martha. Chairman Mike Rogers is back with us now. Chairman Rogers, if you will, take a bigger look. Look at the whole area of Ukraine and tell us why should Americans be concerned about what's going on there? ROGERS: Well, any instability in that region causes economic instability and certainly will impact Europe. If it impacts Europe's economy, it's going to impact the United States economy. You know, when this first happened, Martha, there was a dip in our stock exchange, our markets. So I think they went down 154 points. So it has a direct relationship. We're no longer, you know, completely isolated by the two oceans around the United States. We're interconnected economically. And so we do need to worry about the stability of a place like the Ukraine and we need to worry about the continued advancement, certainly, for reasons of influence or, in this case, taking land, by the -- by Putin and Russia. We've seen this story before. And when we didn't react, as the United States, we thought it would settle itself, we ended up buying into bigger trouble later. And I think that's what you're seeing happening. And at least some notion that we have to diplomatically apply pressure and get our European allies together to start pushing back on what I think is an expansionist attitude by Putin. RADDATZ: But what if this referendum for secession passes? I know the Ukrainian government has to be involved. They say it's illegal. We say it's illegal. ROGERS: Well, it gets a little interesting. So you'll have two sets of problems. On the diplomatic front, you'll have what does Europe do? You know, Germany has -- is so tied to the Russian economy, both from energy and direct business connections back into Russia. You've got some problems with sanctions and how that works out and how they can go forward without screwing up their own economy. Then you have this -- the notion of if they do that, now you have this different legal status. And so some are charging that the Ukrainian overthrow in Kiev was illegal. That's the Russians' perspective, which would allow them, under their interpretation of the law, to have a vote to secede the Crimean Peninsula, to secede from the Ukraine. And Russia has already said in their parliament that they would accept them. ROGERS: And now you have a whole new different set of laws we're going to have to unwind in order to see what -- where we can go, from an international perspective. RADDATZ: Quickly, Mr. Chairman, I was there this week. This seems like this is going to go on for a very long time. But you mentioned Vladimir Putin. ROGERS: Well, listen, you know, well, domestically, he doesn't have a lot going on. That's a problem. He is scoring huge points on his foreign policy. And I think that has bolstered his ability to try to be, you know, a little bit out of the box when he does something like put troops in the Crimea. So I think that's a bit of it. I do think that he wants to be back on the world stage, he wants to be a world influence. And if he has to do it through brute force, he's going to do it. That's his mentality. We shouldn't underestimate the kinds of things that he will do that he thinks is in Russia's best interests. I think up to date, we thought it was a different century and the administration thought well, if we -- you know, if we just act nice, everyone will act nice with us. And that's just, unfortunately, not way that Putin and the Russian Federation sees the rest of the world. RADDATZ: OK, thank you very much for joining us this morning, Mr. Chairman. ROGERS: Thanks. RADDATZ: Russian and American leaders squaring off, echoes of the dramatic cold war confrontation that had both countries on edge for decades. And just this weekend, a new reminder -- a Russian military official hinting the Ukraine crisis may lead them to consider suspending inspections of the Russian nuclear arsenal. UNIDENTIFIED MALE: That signal means to stop whatever you are doing and get to the nearest safe place fast. RADDATZ: That very real threat of nuclear war seems a long time ago. But watching developments this week, it was hard not to think about those bad old days of the cold war. Russian troops on the march, the U.S. sending fighter jets to Eastern Europe. Vladimir Putin test firing an intercontinental ballistic missile. That ICBM, though unarmed, an especially sharp reminder that America still remains on alert for nuclear war. Across the frozen plains of our country are scattered 450 of them -- nuclear-tipped missiles that could destroy the world, still manned every hour of every day. (on camera): You could drive by this remote site and have no idea there was a nuclear missile silo here. But essentially, the nuclear warhead is just 10 feet below me. (voice-over): We traveled to missile sites and training facilities to see how the Air Force maintains the nuclear arsenal. Each missile silo is connected, along with nine others, to a control capsule nearby, buried 60 feet underground. Behind blast doors, inside five foot thick concrete walls, launch officers have their fingers on the nuclear trigger. UNIDENTIFIED FEMALE: Step one launch is started. RADDATZ (on camera): So it would only take four people to launch a nuclear weapon? RADDATZ: That's pretty heavy stuff. (voice-over): But if the president gave the word, they would be ready. UNIDENTIFIED FEMALE: Most of us here think about that pretty much every time we're on alert. RADDATZ: The young officers are on alert duty eight times a month, all alone, underground for 24 hours. RADDATZ: It's not the most exciting job in the military. UNIDENTIFIED FEMALE: Two, one, (INAUDIBLE). RADDATZ: Even though it comes with an unbelievable responsibility. That pressure has been overwhelming for some. The nuclear force has been plagued with scandals: cheating, drugs, alcohol abuse, gambling. But the mission goes on. MAJ. GEN. JACK WEINSTEIN, COMMANDER, 20TH AIR FORCE: The system is safe 24 hours a day. I sleep well at night knowing the people we have out there. I really do. RADDATZ: Colonel Steve Ganyard is back with us now. And, Steve, what about these threats to not allow nuclear inspections? GANYARD: I think this is just more saber-rattling by the Russians. I think this is just something to turn up the heat. We probably won't be too concerned about it. These treaties have been on the Cold War downhill for a while. GANYARD: Right. It's really because it's limited. And do we really want to go and rattle saber in the face of the Russians? The things that we have done, we've put six more F-16s, if we look at the map, up in Lithuania. There's a contingent patrolling the Baltics up there. But, oh, by the way, Crimea is in the Black Sea, so we're patrolling the wrong sea with our airplanes. It really doesn't do any good. It makes us look, I think, rather foolish to put airplanes a thousand miles away. We can't get ships, we couldn't put an aircraft carrier by treaty into the Black Sea. The Turks aren't going to let us put anything. So we are really -- we're rattling a saber so far away that the Russians will never hear it. RADDATZ: And that is dangerous in itself. GANYARD: It is. It is. We are back in just two minutes with Jon Karl's exclusive interview with tea party star and Republican lightning rod Ted Cruz. JONATHAN KARL, ABC CHIEF WHITE HOUSE CORRESPONDENT: So you honestly think there's a chance that you could get Obamacare repealed? Every word, as you've said. SEN. TED CRUZ (R), TEXAS: Every single word. RADDATZ: Then the powerhouse "Roundtable" with instant analysis of Cruz. Plus what's next for Republicans after this week's conservative all-star bash? And later, the Francis effect. One year after becoming pope, are big changes ahead for the church? Right back in just two minutes. RADDATZ: Conservative all-stars headlining this week's CPAC convention, where a big question seems to be what will it take for the GOP to unite? Some key stars looking to take the party in different directions, including the top two finishers in Saturday's straw poll: Rand Paul; and our next guest, Ted Cruz, who in less than two years has shot from obscurity to Republican star. KARL (voice-over): The Conservative Political Action Conference, CPAC, like Woodstock for right-wingers. Three days of music and tough talk. SEN. MITCH MCCONNELL (R-KY), MINORITY LEADER: The president of the United States is treating our Constitution worse than a placemat at Denny's. KARL: It's the year's biggest gathering of possible Republican presidential candidates. SEN. MARCO RUBIO (R), FLORIDA: The policies they pursue have never worked. And they work less now than ever before. GOV. CHRIS CHRISTIE (R), NEW JERSEY: If that is your attitude, Mr. President, what the hell are we paying you for? SEN. RAND PAUL (R), KENTUCKY: I believe what you do on your cell phone is none of their damn business. KARL: CPAC brings together the right and far right: libertarians, gun enthusiasts, tea partiers. The woman running this booth has a new favorite, Ted Cruz. UNIDENTIFIED FEMALE: Even if it's going to hurt him politically, he will stand behind his principles. He's a man of principles. KARL (on camera): How's it going? (voice-over): We caught up with Senator Cruz at CPAC. He was a virtual unknown just a year ago. Not anymore. KARL: Cruz led the fight over Obamacare that shut the government down last fall. More recently, Russia's invasion of Ukraine has opened up a new line of attack for Cruz against President Obama. CRUZ: A critical reason for Putin's aggression has been President Obama's weakness. That Putin fears no retribution. Their policy has been to alienate and abandon our friends and to coddle and appease our enemies. And so Putin -- you better believe Putin sees in Benghazi four Americans are murdered and nothing happens. There is no retribution. You better believe that Putin sees that in Syria, Obama draws a red line and ignores the red line. KARL (on camera): OK. So how would you stand up? What would you do? Military action? CRUZ: No. No, look, not at all. KARL: Sanctions? Would you do sanctions? CRUZ: Absolutely, yes. There are a host of things we can do. Let's rewind the clock a little bit. Number one, don't demonstrate weakness for five years. We have seen historically over and over again tyrants respond to weakness. KARL: Obama didn't invent Putin's aggression. CRUZ: But I will tell you when Mitt Romney talked about Putin expanding his sphere of influence, Obama mocked him, said, the Cold War has been over 20 years, nothing to be worried about. And we keep making that mistake with Putin. Putin is a KGB thug. When the protests began in Ukraine, the president should have stood unapologetically, emphatically for freedom. And when the United States doesn't speak for freedom, tyrants notice. KARL (voice-over): Cruz's approach stands in stark contrast with fellow tea partier Rand Paul. Just days before Putin invaded Crimea, Paul said: "I think we need to have a respectful, sometimes adversarial, but a respectful relationship with Russia." (on camera): Senator Rand Paul said: "Some on our side are so stuck in the Cold War era, they want to tweak Russia all the time, and I don't think that's a good idea." What's your reaction to that? CRUZ: I'm a big fan of Rand Paul. He and I are good friends. I don't agree with him on foreign policy. I think U.S. leadership is critical in the world. And I agree with him that we should be very reluctant to deploy military force aboard. But I think there is a vital role, just as Ronald Reagan did. When Ronald Reagan called the Soviet Union an "evil empire," when he stood in front of the Brandenburg Gate and said, "Mr. Gorbachev, tear down this wall," those words changed the course of history. The United States has a responsibility to defend our values. KARL (voice-over): Senator Paul agreed to be interviewed on THIS WEEK to give his perspective, but at the last minute he backed out. On stage, Cruz also blasted fellow Republicans he sees as too wishy-washy, including three of the biggest GOP names over the last three decades. CRUZ: All of us remember President Dole, and President McCain, and President Romney. Now look, those are good men, they're decent men, but when you don't stand and draw a clear distinction, when you don't stand for principle, Democrats celebrate. KARL: And once again, the old guard fired back. SEN. JOHN MCCAIN (R), ARIZONA: I wonder if he thinks that Bob Dole stood for principle on that hilltop in Italy when he was so gravely wounded. KARL: But upsetting well-established Republicans is precisely how Cruz quickly became one of the right's biggest, most controversial stars. He's utterly unfazed by the return fire he's taking from those who say he's hurting the party with his brand of no-compromise politics. That Tuesday lunch they have, every Tuesday? He is going to need a food-taster. So tell me, have you considered that? CRUZ: Well, Jon, I will tell you, you've actually become somewhat of a folk hero back in Texas. We went back and I had multiple gatherings where people came up and actually asked if they could serve as the food tasters. KARL (voice-over): If Republicans win back the Senate this fall, he vows to push even harder. CRUZ: -- "every single word of ObamaCare." KARL: It is a bizarre proposition. CRUZ: It is the most unpopular law in the country. Millions of people have lost their jobs, have lost their health care, have been forced into part-time work, have their premiums skyrocketing. And right now, Washington isn't listening to those people. That's how we win elections and that's also how we repeal ObamaCare. KARL (voice-over): In other words, expect an even feistier Ted Cruz if Republicans win big in the fall. We're back in just two minutes with the roundtable's instant analysis of Senator Cruz and those Republican risks heading into 2016. Then, how the pope became a rock star, as Francis marks his first anniversary. REP. PAUL RYAN (R), WISCONSIN: The way the left tells it, the Republican Party is in this big massive civil war. It's Tea Party versus establishment, libertarians versus social conservatives. There's infighting, conflict, back biting, discord. Look, I'm Irish. That's my idea of a family reunion. RADDATZ: All in the family at CPAC there, according to Paul Ryan. The roundtable is here. 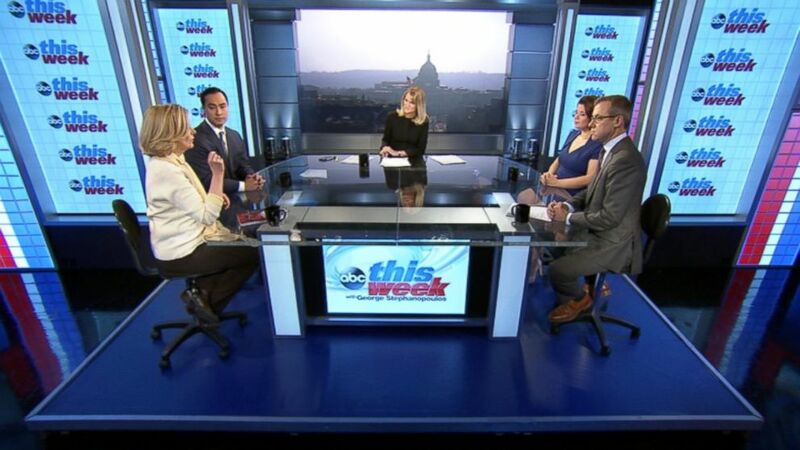 Texas Democratic Congressman Joaquin Castro, Peggy Noonan from "The Wall Street Journal," ABC's senior Washington correspondent, Jeff Zeleny, and Republican strategist and ABC News contributor, Ana Navarro. Welcome to all of you -- and, Jeff Zeleny, I want to start with you, because you were there this week at CPAC. We heard Jon's report, his take. What's your take, impressions, different tone? JEFF ZELENY, ABC NEWS CORRESPONDENT: I mean, Paul Ryan is right, there are a lot of different views. But one thing I picked up by watching his speech, he's more serious about running for president than he lets on. So that's one quick takeaway. But, look, there is a healthy debate going on inside the Republican Party. But it's also on foreign policy and the crisis in Russia. We've seen a huge division here. And Rand Paul, you know, he may not say his views are isolationist, but that's how a lot of Republicans hear them. So I was struck by how focused on foreign policy CPAC was, just because it's coming at this big moment. But a lot of time for comebacks and reintroductions. Chris Christie top of the list. He got a big applause line. RADDATZ: All right, we're going to come back to foreign policy in a second and those splits. But Peggy Noonan, who made the biggest impression on you? What is Ted Cruz up to? PEGGY NOONAN, "THE WALL STREET JOURNAL": It's hard to say as you look at him. Sometimes he seems to be a guy who wants to be president and is putting himself forward. Sometimes he acts like a guy who, ah, I don't want to be president, meaning he doesn't do some standard peaceful party embracing and bringing people together. I think what he was part of, this CPAC thing, Paul Ryan and with Rand Paul, what struck me so much the past week is the intellectual diversity, the diversity of stands and stances, and how everybody, pretty peacefully, often with good nature, was debating each other and trying to figure out the actual meaning, currently, of Republicanism. NAVARRO: It's part revival, it's part carnival scene. But there was one of everything. NAVARRO: And it really looked like a Noah's Ark. There was one of every type of (INAUDIBLE) that was in the Republican Party. There was social conservatives, libertarians, foreign policy hawks, foreign policy doves. NAVARRO: And everybody was saying their piece and got a pretty good reception. Actually, to me, one of the takeaways was that Ted Cruz was not the story out of this CPAC. To me, the big takeaways were that Chris Christie got a very good and warm reception. NAVARRO: He did a great job on his speech. RADDATZ: -- why was he wearing tortoiseshell glasses? NAVARRO: Marco Rubio owns the foreign policy mantel amongst the new generation of Republicans. Those were the big things I saw at CPAC. RADDATZ: Did the Republicans really expand their brand? CASTRO: I don't think they have. You know, and every year, CPAC really is a demonstration of their extremism. And, you know, there was a very telling picture that was Tweeted out of a panel about minority engagement and minority outreach. And the room was literally empty. So it's as if the party has not moved forward at all with that since 2012. RADDATZ: I want to move to the politics of Ukraine crisis. And you brought that up, Jeff. There is this clear division over foreign policy. I want to read something that Senator Lindsey Graham Tweeted. He said, "It started with Benghazi. When you kill Americans and nobody pays a price, you invite this type of aggression." Another said Putin basically came to the conclusion after Benghazi, Syria, equipping, everything Obama has been engaged in, he's a weak, indecisive leader." ZELENY: It is. And this signals a -- I guess, a break that the old adage that the politics stops at the water's edge is completely out the window. I mean -- but we did see sort of a difference in who was willing to criticize the president. I thought Senator Rubio again distinguished himself by basically saying now is not the time to criticize President Obama. You can dislike his foreign policy, but he is not why Putin is doing this. And I think that's pretty much right on. RADDATZ: -- is it an appropriate time to be criticizing foreign policy? I mean it's happened before. NOONAN: I have been struck, actually, when it comes to criticizing President Obama, he, it doesn't seem to me, in some respects, is acting like there is an air of crisis or urgency here. He's sort of off for the weekend in a way that startles me in the middle of a crisis. Look, you can always criticize an American president, particularly on this case. I suppose you can say that Putin did not do what he did because of the American president. But Putin sometimes makes his moves when he perceives an American president to be weak. He did that in '08 at the end of the Bush era, when Bush was weak. He's doing it as he reads Mr. Obama now. CASTRO: You saw from the very beginning how this was all about politics. Right away, the Republicans jumped on the president, when this should have been a moment that the country was really rallying around the United States and coming together. And that was very strange to see. And I don't think we've seen something like it in the past. NAVARRO: You think George W. Bush would agree with that? NAVARRO: That there hasn't been criticism? NAVARRO: There's been plenty of criticism. I think there's a stark difference between when we are under attack and when we are a third party to an international crisis as far as criticism. And some of the criticisms are very valid. There's been a lot of vacillation, lack of clear direction, blinking by this administration. Now we are where we are, and I think it's time that people get together and what the actions should be, what the sanctions need to be and where we go forward. RADDATZ: I want to move to the Obamacare delay. The latest news is President Obama now saying if you like your plan, you can keep it for two more years. Take a look at some of the headlines. So his latest delay in fully implementing the law will allow insurers to offer health plans that do not meet the minimum coverage requirements for another two years. Is this another example of the law not being ready for prime time? Hit you with that. No, it's an acknowledgment that some folks had plans that they wanted to keep. These are not best plans on the market, but I think it's an acknowledgment by the administration that some folks do want to keep them. UNIDENTIFIED MALE: It's also an acknowledgment that some Democrats are in huge trouble in Senate races and they really are hoping for some relief. RADDATZ: Yeah, is this all about politics? NOONAN: It's also an acknowledgment that this whole thing didn't work from the day the website was unveiled. I really think Obamacare as a domestic public policy event is even huger than all of us think. It's a day-to-day story. And so you know the latest story and it is what it is. But this is a most extraordinary failure by an administration that put all of its chips on it working and it is not. It's also significant, I think, that the president had every chance in the past year, Republicans were coming to him and saying, please, hold this off. You can't cancel it, but delay it for a year, do this, do that. He would not play ball with them. It would have been so much better for him if he had. CASTRO: Their only approach has been repeal. You heard if from Ted Cruz who is essentially the leader of the Tea Party. CASTRO: It's either for them it's either all or nothing. And if you look at the way they try to do it, it's just repeal or it's nothing. They don't to want improve it. NOONAN: They asked for a delay. ZELENY: What this means, is voters will not get cancellation notices a month before the midterms. That's the biggest point here, that the biggest point. It is politics no question. RADDATZ: Certainly politics in everything. Come on, we're in Washington, D.C.
NOONAN: But is there still a law? Is there still an Obamacare law? It's been changed in 25 ways. NOONAN: I mean, oh, my goodness. I mean, what the heck is it? CASTRO: People are benefiting from it. RADDATZ: OK, thank you all. Lots more round table ahead. We'll weigh in on the first year for Pope Francis. but But now our "Powerhouse Puzzler." This week's question, everybody, "who was the first president to meet with the pope at the Vatican?" Back in only two minutes to see if the roundtable, and you, can guess the answer. RADDATZ: OK, so who was the first president to meet with the pope at the Vatican? Let's see who knows their history -- Ana. NAVARRO: OK, this is a total guess, but I'm going with Nixon for $400. CASTRO: Nixon. I'll go with Nixon. RADDATZ: President Nixon, President Nixon. Way too many Nixons, way too recent history. The answer President Woodrow Wilson met the pope in 1919 during a tour of Europe following World War I.
NAVARRO: OK, that was a hard one. RADDATZ: Back with more about the current pope and the Francis effect right after this. RADDATZ: Pope Francis this morning at the Vatican getting ready to mark the first anniversary of his papacy. This week, he's been called a Catholic rock star, pumping new life into the church right when it seemed to need it most. So what's next? The roundtable weighs in after ABC's David Wright. DAVID WRIGHT, ABC NEWS CORRESPONDENT: At the start of lent last year, Jorge Mario Bergoglio was just a face in the crowd. Today, Pope Francis is the most talked about person on the worldwide web, almost single-highhandedly redefining the Catholic brand. UNIDENTIFIED MALE: I think he's done a lot to shake up things. UNIDENTIFIED MALE: He seems to be very popular. And I like him. WRIGHT: According to a new Pew poll, 85 percent of Catholics view him favorably. 71 percent see major change. He's kind of a rock star. TIME's person of the year. The cover of Rolling Stone, now there's even a Francis fanzine. COKIE ROBERTS, ABC POLITICAL CONTRIBUTOR: He has become a celebrity, and he's clearly uncomfortable with that to some disagree. WRIGHT: This week Francis told an Italian newspaper he's neither a star nor a superman. The Pope, he said, is a man who laughs, cries, sleeps soundly, and has friends just like everyone else. A normal person. Of course, that humility is partly what people respond to, his modest apartment, his old jalopy, and his message to church officials who have been steeped in luxury: live simply, do for others, champion the poor. ARCHBISHOP JOSEPH KURTZ, PRESIDENT, U.S. CONFERENCE OF CATHOLIC BISHOPS: He's not asking us to change the teachings of our church, but he is saying let's not get so pigeonholed. WRIGHT: He has kept the hard line on contraception and abortion, but asked about gay priests, he famously said, who am I to judge? The church still vehemently opposes gay marriage, but just this week, Francis signaled an openness to the idea of civil unions. UNIDENTIFIED MALE: I am a gay man. So I feel -- I never felt like I had a spiritual home like growing up. So I feel very welcome here. WRIGHT: But plenty of other constituencies remain skeptical. This week survivors of priestly sexual abuse were outraged by his remark that the church is unfairly under attack. Many women too are eager to see major reforms. ROBERTS: The big change I'm looking for from this pope is how he puts his words into actions. WRIGHT: According to the Pew poll, the Francis effect hasn't yet translated into higher attendance in church. But it is early days, his first time as pope leading this season of sacrifice. For many, a welcome change. For THIS WEEK, David Wright, ABC News, Los Angeles. And now back with the "Roundtable." The perfect "Roundtable" for this subject since all of our panelists are Catholic. I want to look down at a few other numbers from this Pew poll. Pope Francis, 84 percent favorable Twitter mentions, it was 30 percent for Benedict. Forty percent of Catholics are praying more, 68 percent say he's making a major change for the better in the church. Politicians would kill for those numbers. RADDATZ: But what gave you that voice? Why is it so different? NAVARRO: Frankly, that he's focusing on the people. He's focusing on what the church should focus on: serving the poor, serving the needy. That he's being inclusive, not exclusive. He's not being judgmental. He's just asking people to be part of the church family and that he's leading by example. He's talking about income inequality, yes, but he has also gotten rid of the throne and gotten rid of the Prada slippers and lives in humility. RADDATZ: But, Peggy, is this just rhetoric? Some of it. Or is there really going to be a change? Do you see a future of change? NOONAN: Oh, I see a change in the tone and the feel of things. I think Francis's two predecessors, John Paul and Benedict, felt, because of the pressures of various emerging questions, that they had to stand as the church in contradiction to modernity and the modern world. They did that. This pope says no, no, no, I don't stand in contradiction to, we embrace. This pope, it seems to me, (INAUDIBLE) the greatest teaching of Jesus Christ was the Beatitudes: blessed are the poor. That's where the pope puts his embrace, in the poor, in many ways, the lonely, the imprisoned. When you are going like this at the world, the world can spoof you. When you are embracing the world, the world loves it. That is part of what is going on here. It's very powerful and I think it's very real. RADDATZ: Congressman Castro, could his rhetoric about unbridled capitalism, social inequality ever really have actual influence on policy? CASTRO: Oh, I think so. You know, I think that he has been a voice for unity, of compassion, of service, of paying attention to the most vulnerable in society. And that strikes a chord with millions and millions of American Catholics. So I think he has been a very good voice and it has spilled over into politics. ZELENY: Yes, it has spilled over into politics. I mean, his name is mentioned again and again in policy debates. Paul Ryan has said he has breathed new life into the debate about poverty. But I'm not sure that this Pew poll -- it says hasn't brought all that many more people into the pews. I have seen a different thing here in Washington. I go to different Masses around town sometimes. I think it has among young people. I see younger people in the pews. And that is something that I haven't seen that for a long time. RADDATZ: You don't have to raise your hand. NAVARRO: You know, I talked to priests in Florida, and they tell me the same thing, that he has brought more people to church. But just the overall enthusiasm, even amongst non-Catholics in the world for the church has grown. NAVARRO: You know, I think it's making a difference with people on the inside. I think it's making a difference with how people feel about their relationship with the church and with this pope because he's just so accessible. He's such a normal guy. You feel like, you know, any moment you're going to pick up the phone and he's going to be on the other line. NOONAN: He has removed some of the stigmas that the church was carrying with it, which has allowed young people to give it a look, and people who had never looked at it with anything but disregard, they're being able to give it a look. So that's a good thing. CASTRO: And he's in year one. RADDATZ: All right. Thanks to you all. Thanks to you all. And go to church. RADDATZ: OK. We'll be right back after this. RADDATZ: Now we honor our fellow Americans who serve and sacrifice. This week the Pentagon released the name of one marine killed in Afghanistan. That's all for us today. Thanks for sharing part of your Sunday with us. And before we go, a special word about the executive at the helm of this program, Washington bureau chief Robin Sproul, she's being honored this week with a First Amendment Service Award from the Radio Television Digital News Association. I'll be there to introduce her for this well-deserved salute. Congratulations, Robin. Don't forget "World News with David Muir" tonight. And have a great day.